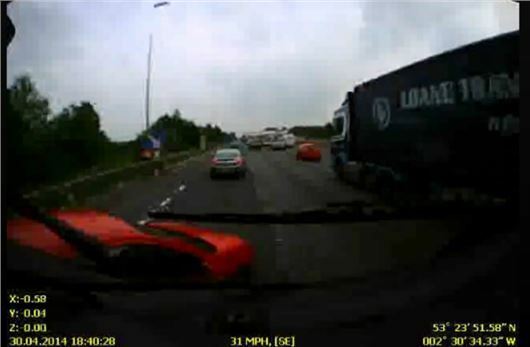 A video capturing the moment a car driver tries to dangerously merge into the motorway and causes an accident has been captured using a SmartWitness crash camera. A red Ford Fiesta is seen driving up the motorway slip road, however it leaves too little room to merge in time. Rather than brake and merge behind the truck - which has the camera installed - the Fiesta tries to push in front and the two vehicles collide. Following the accident the car driver's insurer saw the footage and settled in favour of the truck driver, who was driving for Malcolm Group. Allan Campbell, Malcolm Group Technical Engineer, said "In this instance, the claim was settled very quickly at no cost to Malcolm Group. "Before we installed the cameras, we could often end in messy situations where neither side was accepting blame. In these instances, the courts could often side against the haulier even when their driver was completely blameless due the lack of incontrovertible evidence." I see this all time and I had an almost identical but near miss on the A34 whilst towing a caravan. I know we should make allowances for traffic joining at intersections but the prime responsibility must rest with the driver joining who should make allowances for the traffic already occupying the space on the road and their ability to slow/stop/avoid idiots that try to bulldoze in.